I’ve come to a checkpoint in the construction of the AMBA IP library that’s packaged with MiniTB. After some part-time development over the last couple months, I have read/write support for ABP and basic read/write support for AHB (you can see the full list of supported features here). These are open-source masters and slaves that I developed using MiniTB. MiniTB is a simple yet powerful responsible development platform (RDP) that provides design and verification engineers with an alternative to complex verification methodologies like UVM. That’s what should have been part of the initial announcement I made releasing MiniTB a few months ago. Originally, I envisioned it a smoke testing platform for RTL design engineers. Leaving it at that, though, I think underestimates the power of the simple platform Jean-Marc and I put together and the success people can create with it. MiniTB is not just a framework for smoke testing RTL, it’s a responsible development platform that addresses many of the concerns people have with current methodologies and techniques. Complexity is always the first complaint people have when it comes to UVM. 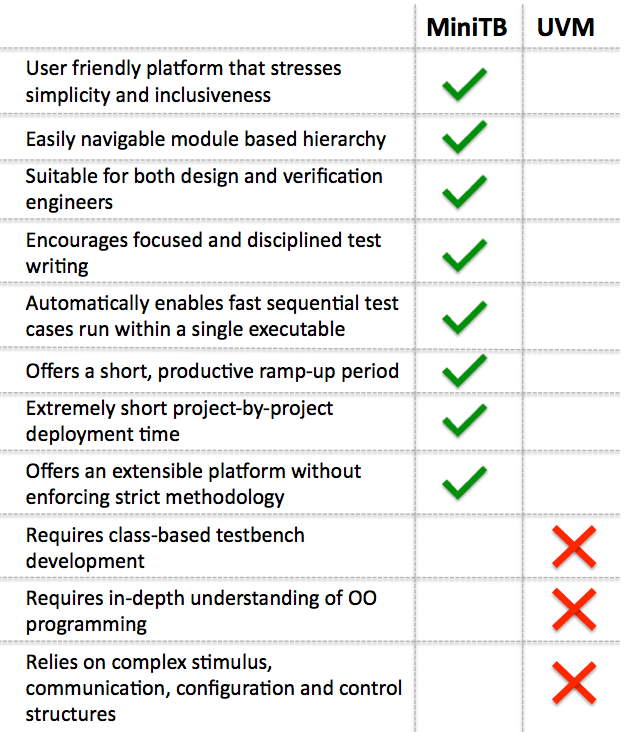 Second is how the addition of OO programming constructs to SystemVerilog has become the wedge that’s been driving design and verification engineers apart for the last decade. MiniTB intentionally stresses a level of simplicity and inclusiveness that have been optimized out of methodologies like UVM – slowly and deliberately. MiniTB is powerful in that it gives you the flexibility to control your own destiny without locking you in. While it neither provides nor enforces complex methodologies around stimulus generation, configuration or communication, it also does not preclude you from leveraging existing methodologies or creating your own as you see fit. In short, MiniTB does not attempt to impose solutions upon functional verification engineers, it simply provides the framework and run-flow in which people are free – design and verification engineers alike – to create solutions that make sense to them. If you’re a design or verification engineer that is tired of the complexity, try MiniTB.